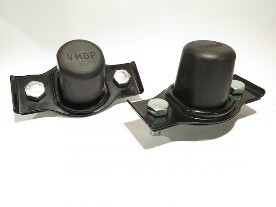 The correct factory design conical/tapered MMM bump stops made exclusively for VMGP. 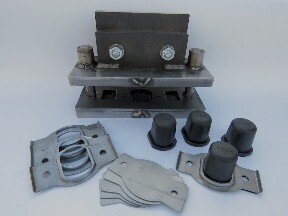 In-house press tooling and one piece moulded factory profile stops with correct hardness. Supplied with zinc plated R Grade HT 5/16th hex head set bolts. Complete with powder coated bases and bolts ready to fit. We also supply rear axle rebound hoops and rubbers.